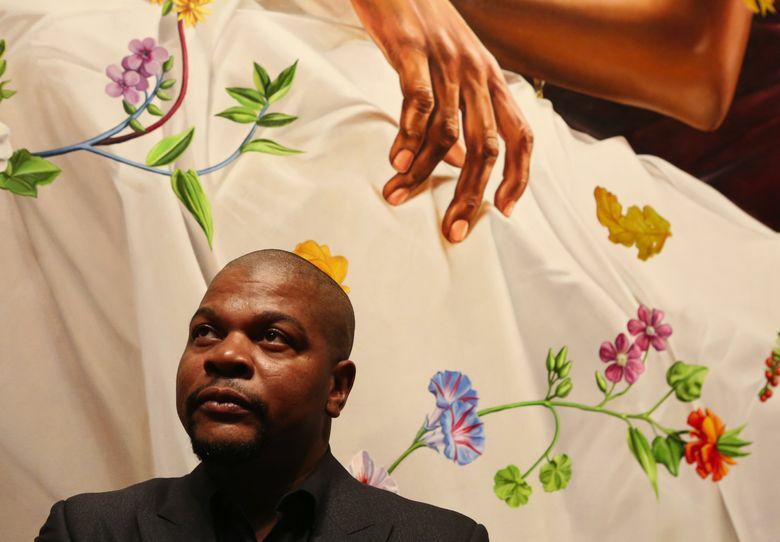 Seattle Art Museum says “A New Republic” by artist Kehinde Wiley — who substitutes people of color in paintings styled after European saints and aristocrats — drew a record-breaking 2,800 people to its opening-day celebration. A young man stares out of a painting, as if assessing us assessing him. 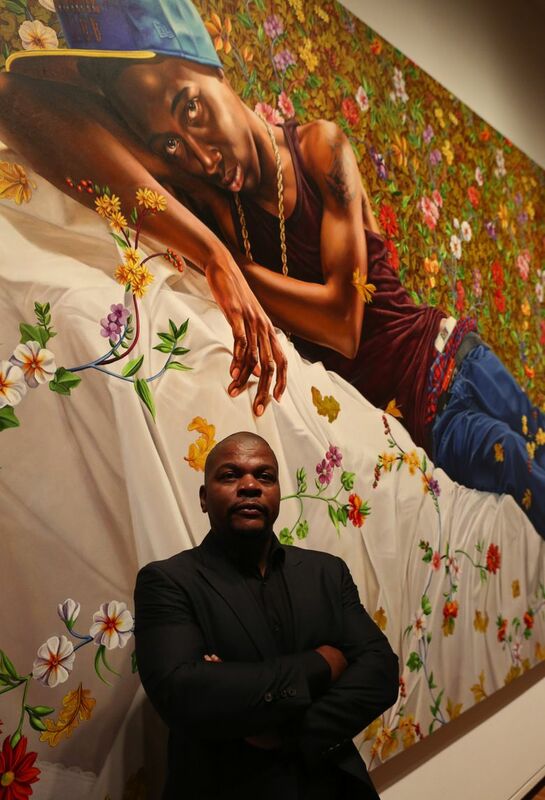 Kehinde Wiley, one of the most significant living American artists, paid careful attention to his baseball cap, dyed blonde hair and glowing brown skin — all of which practically vibrate against a stylized background of tropical flowers. Like most of Wiley’s subjects, the young man (Randerson Romualdo Cordeiro, a favela-dweller in Brazil) was “street cast” — approached by the artist and his assistants to ask if he would pose for photographs which might be transformed into one of Wiley’s wildly popular, beautifully crafted paintings. 10 a.m.-5 p.m. Wednesdays-Sundays, until 9 p.m. Thursdays, until May 8, Seattle Art Museum, 1300 First Ave., Seattle; suggested donation $12.95-$19.95 (206-654-3100 or seattleartmuseum.org). Footage of these street-casting encounters, and the resulting oil paintings and sculptures, are now on view in a stunning exhibition at Seattle Art Museum, the show’s only stop on the West Coast. Organized by the Brooklyn Museum, the grand and celebratory exhibition carries the hallmarks of a retrospective, despite the fact that Wiley isn’t even 40. Wiley is prolific and widely collected, and there are pieces I wish were included here. “Sleep,” for example, a large horizontal painting of a sheet-draped, reclining man, would have bolstered the theme of the martyred, eroticized male body. But “A New Republic” is spectacular, in every sense of the word. SAM spokesperson Rachel Eggers reported record-breaking attendance during the opening-day celebration, with more than 2,800 people streaming through the doors. As you wander through the galleries, pulled from huge painting to huge painting, the faces of people of color gaze at you, larger than life and embedded in overtly artificial, brightly patterned backgrounds. And therein lies Wiley’s genius. These paintings — and the more recent sculptures — invite us to forge relationships with the figures while forcing us to contemplate artifice, posturing and cultural constructs. Wiley asks us to think about biases in the art-historical canon and pop culture, as well as issues of race, class, gender and sexual orientation. He fuses awkwardness with elegance, intimacy with spectacle. 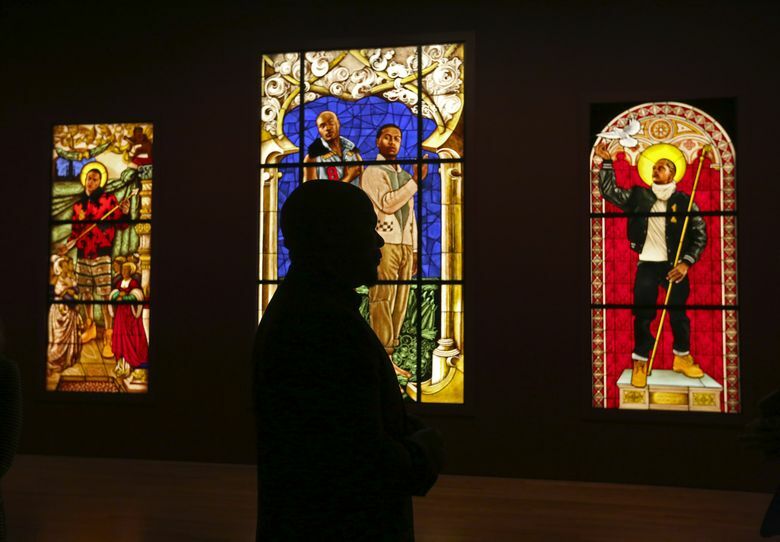 In his best-known works, such as “Saint George and the Dragon,” Wiley deftly toys with European masterpieces, replacing the white men who commissioned portraits of themselves with the black men Wiley approaches on the street. It’s not so much a reversal of art history as a strategic appropriation. Wiley has his critics. In a 2015 New York Times review, critic Roberta Smith wrote, “his often thin, indifferently worked surfaces can leave something to be desired as paintings.” But this misses the mark. Wiley renders realistically familiar portraits while highlighting the artificiality of image-making. Yes, his forms are often flatter, the colors more high-keyed than the originals. They’re meant to be. “A New Republic” shows Wiley increasingly playing with his own art. 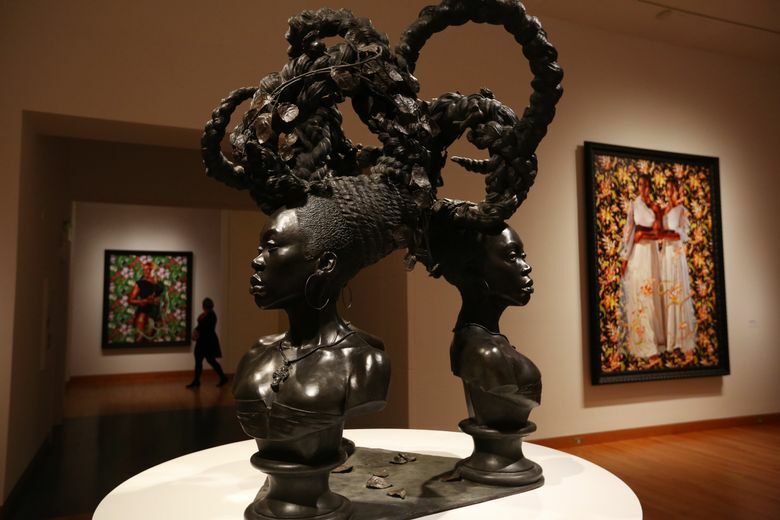 His recent paintings and sculptures of women circle back to his early interest in hair as a marker of black identity. In an effort to disrupt the disaster narrative in Haiti, Wiley broadcast open calls on posters and the radio, asking women if they thought they represented “the face of Haiti.” Hundreds lined up for his contrived beauty pageants, complete with prizes. Pageantry is integral to Wiley’s work, from the pageant of the sidewalk to the grand, historicizing display of paintings. Wiley invites us all, with people of color as the guests of honor.